When Governments brief their most loyal press pals first, one should always be suspicious of their motives. 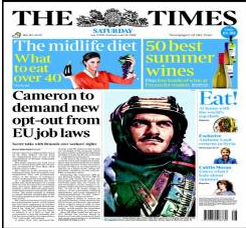 So when the Murdoch Times was first out of the blocks to tell that Young Dave was going to get jolly tough with all those ghastly Europeans on employment laws as part of his negotiation on Britain’s membership of the EU, the rest of the Fourth Estate would have been best studying the fine print. Most did not. You foreign cheppies over thyah! Hend beck those powers I just thought of right now!! Jolly good sheow!!! 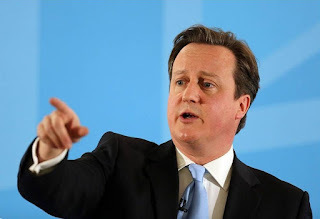 What Cameron is reported to be either demanding, or hoping to achieve (depending on which paper’s account is consulted), is to opt back out of the 48 hour maximum in the Working Time Directive, together with another directive giving agency workers similar rights to those enjoyed by full-time staff. These can be traced back, respectively, to Tone and Pa Broon, and must therefore, for the right-wing press, be A Very Bad Thing. For the Mail, it was a demand: “David Cameron is to demand new opt-outs on EU employment rules in his renegotiation talks with the European Union … The Prime Minister will seek to restore two key exceptions on the EU’s social chapter that were jettisoned by Tony Blair”. And do we have a ready-made excuse for this move? As if you need to ask: “It has been claimed that it puts patient care at risk by increasing the number of handovers necessary between medical staff in hospitals while decreasing clinical experience for junior doctors”. Yes, the dastardly EU is going to make the NHS a yet more deadly place to go, and may even kill people. The Telegraph - which does not credit the Times - takes a similar line, with the suitably slanted opening paragraph “David Cameron will demand that Britain is able to ignore most of the employment rules imposed on the UK by Brussels as part of his renegotiation with the European Union, it can be disclosed”. Imposed by the UK voting for them, that is. But the Tel gives the game away by all the hedging in the article. 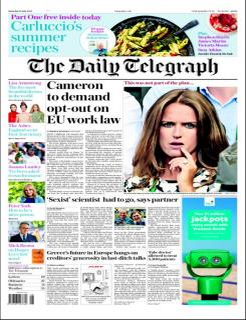 “The Telegraph understands Mr Cameron told colleagues last month that he would like to see a full opt-out restored … Mr Cameron indicated he wanted the directive scrapped while in Opposition [but did nothing at the time] … Mr Cameron’s bid … is likely to be backed by Germany, it is understood … Angela Merkel, the German chancellor, is said to have been willing to review the working time directive”. That one needs a trim. That tells you there is a considerable amount of speculation in this story. Moreover, the Guardian’s more nuanced “David Cameron is hoping to opt out of EU employment law directives as part of his renegotiations of Britain’s EU membership, said Conservative sources” merely confirms that the right-leaning press is over-egging this particular pudding. Even arch anti-European Bill Cash has said “It would be extremely good to seek to achieve this. The problem is whether other states would even contemplate it”. So that’s another briefing creatively reinterpreted by the Tories’ pals without anyone stopping to engage brain first. There will inevitably be more of this to come.